It made a dreadful noise when I pushed the button. My 30+ year old blender finally gave out. It blended for the last time. It was a sad day and a happy day. The loss of a trusty appliance was balanced with the fun of finding a new one. The hunt began and ended in a few short days. Then it was a matter of playing with my new toy. Blender Bourbon Chocolate Pudding is the first thing I made. Big thanks to my fellow foodie friends. They helped a lot in my search for a new blender. I asked for recommendations in a group and received much feedback. I finally decided to go with a Blendtec 575 Classic (Amazon affiliate link). So far so good. It is much louder than my old one though. I’ll just take it as a sign of a heavy duty motor. Fingers crossed it lasts 30+ years too. Mousse is what it was supposed to be. I had my doubts as soon as I saw the original recipe. I figured it would wind up like pudding in the end. Sure enough, that is exactly what happened. I have to admit there was a mousse-like quality at first. Yet the air bubbles deflated rather quickly when I was scooping it out after chilling. So I stirred it some and was happy with it winding up as pudding. 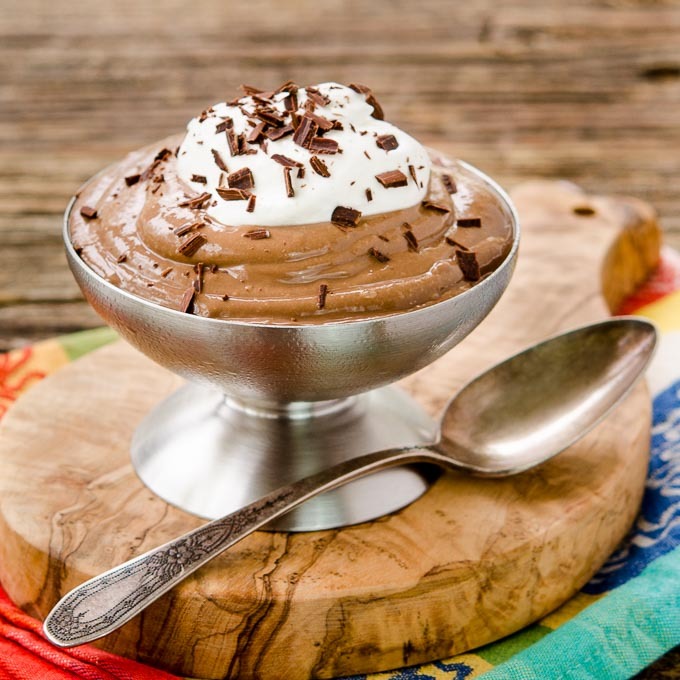 Blender Bourbon Chocolate Pudding is a dessert for adults. You would have to substitute something else for bourbon to make it kid-friendly. I’m thinking a teaspoon of vanilla would work. However then it would be only chocolate pudding. Either way it is a breeze to make. Heat some milk then start blending. Chill it, stir, and enjoy a silky smooth treat. Make it extra special by plopping some whipped cream on top and sprinkling it with chocolate chips or shavings. Today is a big day for my hounds. Both are going to the vet. Milo is getting neutered. Zephyr is getting his teeth cleaned and some lumps removed. Both are getting micro-chipped. I’ll be waiting on pins and needles until they are back home. Then comes after surgery care and time for healing. I can only hope all goes well and they heal quickly. Blender Bourbon Chocolate Pudding is a rich, creamy, and easy to make dessert with only 5 ingredients. Top with whipped cream to make it extra special. Heat milk in a saucepan to 180°F. Pour milk into blender and add chocolate chips. Blend on high speed until combined and smooth. Add eggs, bourbon, and coffee. Blend on high speed for 2 minutes. Pour mixture into a bowl. Lay plastic wrap on top to prevent a skin from forming. Cool to room temperature then chill overnight. Stir just prior to serving. 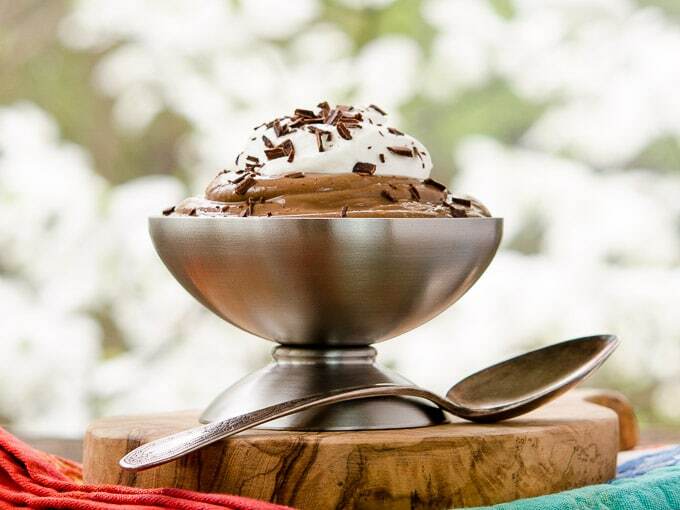 Serve topped with whipped cream and garnish with chocolate chips or shavings if desired. 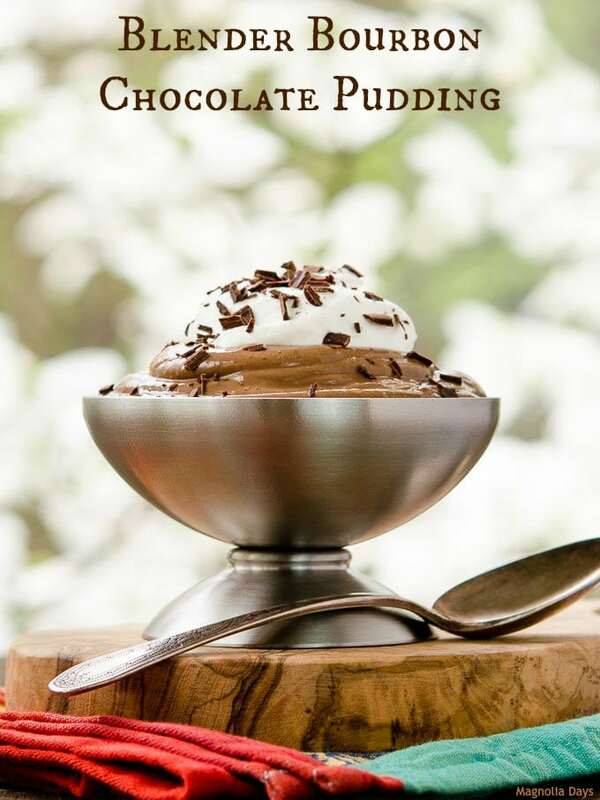 Time stated does not include chilling pudding prior to serving. Recipe adapted from one in the Southern Living 1985 Annual Recipes cookbook (out of print). This sounds amazing! i must make this asap! Is there a particular bourbon you would suggest? or just a personal favorite? I used 1792 Ridgemont Reserve however I think your favorite would work just fine.